After a question on on the blog, I decided to do some research to find out just what is better to top off your bottle – a screw cap or a cork! Most rum enthusiasts in my experience prefer a screw cap to cork. 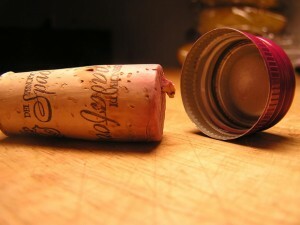 Screw caps are better because they do not crack or dry out like the odd cork is prone to do. Because they provide a tighter seal, they also prevent leakage. Some rum lovers however prefer the look and feel of cork for traditional reasons, and because it looks classier & is historically associated with good rums. Personally I just like the squeaky pop is it leave the bottle neck! However as rum doesn’t age any more once it is out of the barrel and into the bottle the idea of allowing it to “breathe” like wine is a bit pointless! If you are collecting rums, screw caps are definitely the way to go. Corks aren’t designed to be removed many times so the seal will lessen with time and the rum leak/evaporate or even worse oxidize! There is nothing worse than buying expensive rum and then having it spoilt because the cork leaks. As in the wine industry I think screw caps are here to stay. They are environmentally more friendly, cheap, plentiful and the best means of sealing a bottle. Whatever your preference, once it’s in the glass you won’t care how the bottle was capped- you’ll just savour the flavour! Leave your thoughts below, I’d love to hear them! Valuable info. Fortunate me I found your website by chance, and I am surprised why this accident did not came about in advance! I bookmarked it.